Based in Northville, Michigan, Gentherm is the global leader in thermal technology with various locations throughout the world. Gentherm designs, develops, and manufactures heating, cooling, and ventilating devices for global markets. Media Genesis and Gentherm have been working together since 2004 on a multitude of projects including, website design and CMS build, consulting, video, and social media management. The current Gentherm.com website was built in 2014 and since launching, its mobile traffic has nearly doubled in users. 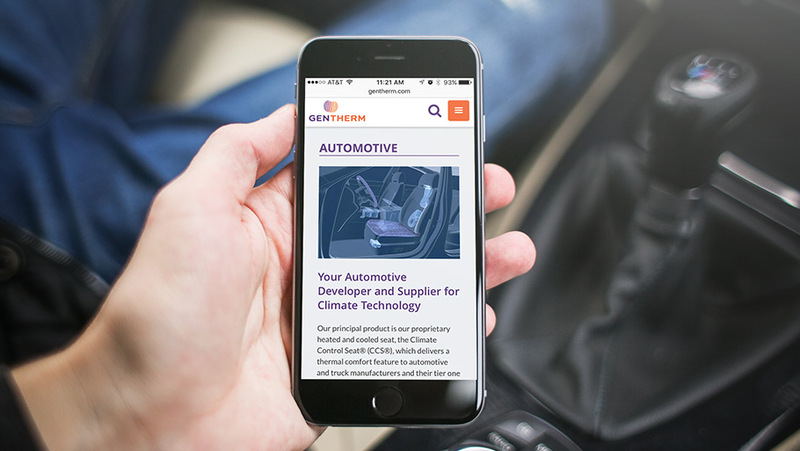 Gentherm came to Media Genesis to find a solution to improve the websites’ usability on mobile and tablet devices. Media Genesis recommended a dedicated mobile website that would be responsive and have a custom design and layout, separate from desktop. Due to the ever changing environment of the mobile space, this project also included on-going maintenance support and analytics monitoring to keep up with the current trends and devices. The first step towards creating a dedicated mobile website for Gentherm was to determine the sections within the website that had the highest mobile traffic. Media Genesis put together an analytic report of mobile traffic throughout the year. This data was used to determine which sections would be accessible on the mobile website and provide the user with easy to reach information. The newly designed dedicated mobile site launched in April 2016. Shortly after its launch, Gentherm enlisted in Media Genesis to translate the mobile content and create a dedicated German language experience for mobile and tablet users. Within the navigation, the user can switch back and forth from an English language site to a German language site.